Jachin, AL (BlackNews.com) — Marjorie’s Beef Jerky is currently shipping to Major League Baseball teams (including to Cincinnati Reds pitcher, Amir Garrett, who loves the products) and NASCAR. In addition, the Black woman-owned company also received a major order to supply products to NFL training camps. The brand, launched by African American entrepreneur Michelle Timberlake, has over 250 VIP celebrities as customers. 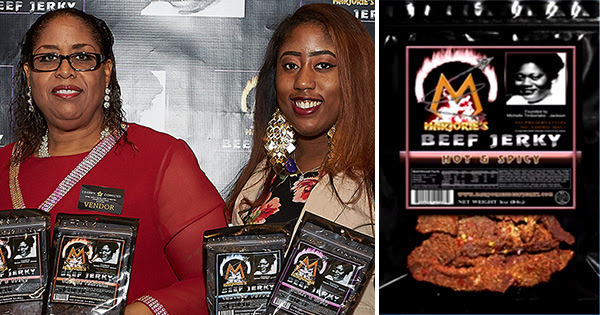 To celebrate her most recent accomplishments, for the next 30 days, Marjorie’s Beef Jerky is being offered at $5.50 per bag with a minimum order of 6 bags. Shipping is $8.25 for 6-12 bags. Michelle welcomes everyone to try the delicious six flavors by offering this product for an amount barely above the wholesale price. Her goal is to bypass the middleman by getting enough customers to allow the price to remain low. Marjorie’s Beef Jerky is made with all-natural ingredients. Its unique flavor is fresh, and its a good source of protein, especially before or after workouts at the gym. A 3-oz. bag is only 150 calories! It’s also good to pair up with appetizers and beverages, and makes as a great gift to send in a care package to those in the military or in college. About Marjorie’s Beef Jerky, Inc.
Marjorie’s Beef Jerky, Inc. was established in 1991 by Michelle Timberlake. Both Michelle and her Vice-President and close friend, Mr. James Martinez, named the company after her mother, Marjorie Leona Dawson, who was her #1 beef jerky fan, and who, before she passed away, convinced Michelle to put her beef jerky out on the market. Or follow them on Facebook and also Instagram and YouTube.